A drunken driver who struck and killed an Oceanside woman as she walked across an Escondido street with her boyfriend last year was sentenced Wednesday to four years in state prison. Joel Francisco Juan, 33, pleaded guilty last month to vehicular manslaughter while intoxicated. 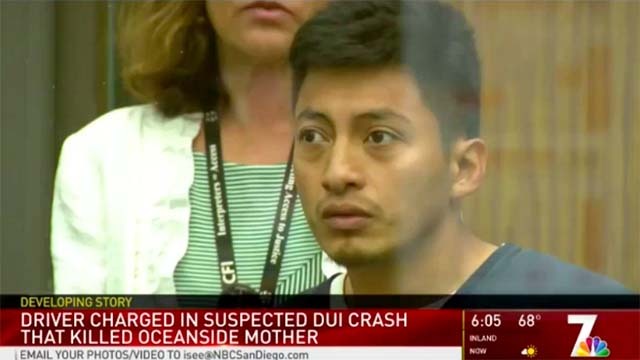 Juan was charged with gross vehicular manslaughter and DUI, including an enhancement that his blood-alcohol level was above 0.15 percent at the time of the June 3 collision that killed 32-year-old Esmeralda Eusebio Guerrero. Witnesses told police that Juan — driving a Ford Ranger pickup — was traveling west on East Washington Avenue near North Ash Street when he approached the couple crossing the street and swerved to avoid Eusebio Guerrero’s boyfriend but instead hit her, Escondido police Lt. Mike Kearney said. The victim — the mother of a 10-year-old daughter — was taken to Palomar Medical Center with head injuries, multiple internal injuries and two broken femurs. She was pronounced dead about five hours after the 12:40 a.m. crash.